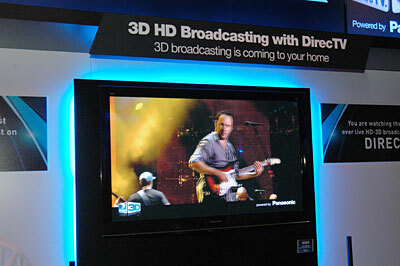 DirecTV along with Panasonic displayed a satellite feed of 3D content at CES 2010. Reps for the satellite provider confirmed plans to launch a 3D channel this coming June (which is when ESPN says they will launch their 3D network…coincidence?). I should reiterate though the company is hopeful of launching in June, as no exact date was mentioned. DirecTV says the 3D content will be available on more than just one channel. According to a press release there will be a 24 hour Pay-Per-View channel which will have premium 3D movies and 3D content from sources like HDNet, MTV, NBC Universal. There will also be an On Demand channel. And finally, there will be 3D demo channel displaying sports, music and other content. In order to view the movies in 3D you’ll need a 3D HDTV and shutter technology glasses. The DirecTV feed at CES was being viewed with Panasonic’s TY-EW3D10 brand of 3D glasses, which sync with LED signals from the 3D TV. Previous Previous post: 28 Days Later… or, How Netflix Made Nice With Warner Bros. It will be so nice to Watch 3D at home. Technology doesn’t have any limits. So, keep it up. Really excited to watch sports, movies and animation picture 3D.